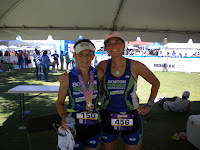 Janice Biederman and I made our way down to the Sunshine State for Florida 70.3. Ironman found a new venue for 2012, and I think they have a winner. I would go back again. Janice is not so sure, despite the fact that she podiumed!!! Way to go Janice. The trip started off with a bang, with Janice discovering her credit card and license missing from her wallet. 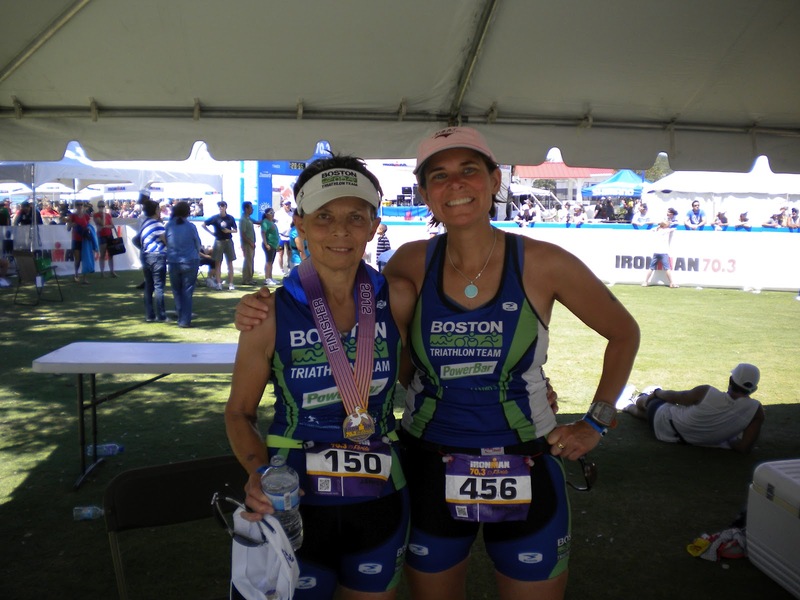 With no picture ID, she used her mid-west charm and flexed her Ironman muscles to get on the plane (and through IM registration) without a picture ID. Well done Janice. · Facing the reality that this was NOT a wetsuit swim. 82 degrees. One degree shy of a complete wetsuit ban. · Race morning, my speed suit did NOT pass the legal test. No worries. I have my credit card, I’ll just buy one now. I think the game warden (chief referee) thought I was high- the IM shop was not open at 5:30 AM. · Finally as I was walking to the beach, some tool with a Boston area uniform, warned me about the brain-eating amoeba that is present when the water temperature gets too high. He said he considered backing out, as he had heard about a kid who was waterskiing, took water in the nose, and was dead within the week. Thanks a lot ***hole. At least I was no longer concerned about the alligators. The actual swim was sort of nice. It was like bathwater – a balmy 82 degrees. I was in an early wave. Waves were still going out upon my return, 57 minutes later… I am OK with my swim, considering no wetsuits. NOTE: I thought of Joe/Crystal during the swim, as some guy got a good hold of my back and almost dunked me. The swim course was a crazy M-shape, which meant 4 turns. Turning at buoys is always a cluster-f***. All in all, a decent swim. No alligator attacks. Can someone check in with me in 7 days to make sure I haven’t succumbed to an amoeba? What Trish left out about the swim was the quality of the water. Because the bottom of the lake was rather undulating at the beginning, we started about 20 yards from shore. This required us to stand in slimy muck waiting for the gun to go off. Within 2 minutes in the muck, I had sunk to my knees. Finding a good draft was impossible, since you couldn’t see your own hands in the water, let alone anyone else. The murky quality of the water also led to a lot of collisions, since you couldn’t see when you were coming up on someone. This also led to some, hopefully unintentional, groping. I did, however, set a PR for the swim. Unfortunately it was a reverse PR… slowest swim. As a slow swimmer, I have added advantage of coming out of the water with mostly men (from the later waves)… which means I am generally surrounded by faster cyclists. I did take advantage of this. Unfortunately this did not go unnoticed. Not quite sure if I got a drafting penalty, as he did NOT say I had to stop at the penalty tent… just to drop back. To my defense, I had just passed a line of 3 guys. I was trying to pass the lead guy, but couldn’t… that is when I got caught. The problem was, I couldn’t drop back, because there was another guy practically on the lead guy’s wheel. Drafting was an issue. Thoughts of Jorge every time I see a team of 2-3 cyclists clearly working together. Unbelievable. For the record. The 2012 venue is NOT FLAT. No raging hills, but there were some decent long and steady climbs. I felt pretty strong the whole bike, but almost lost it with a crazy neck pain. I noticed it around mile 30, I was fairly uncomfortable around 40. By mile 48, I could barely turn my neck without shooting pain. Very happy when I racked my bike. Having done this race in its prior Disney location, this new bike course was quite a shock. Where the old course was almost entirely FLAT, this course had lots and lots of rolling hills, and LOTS OF TURNS!!! The turns in particular, caused a lot of bunching up and inadvertent drafting. There was, of course, some not-so-inadvertent drafting. As I was passed by numerous pelotons. Like Trish, I was having a good ride up until about mile 35. The low back pain set in with a vengeance. It was too painful to stay in the aero bars. The bottle (and cage)-ejecting rough road did not help the back situation at all. Like Trish, I too was happy to get off the bike. This was a 3-loop course, which I like… I felt like I was on autopilot and could use visualization for the 3rd loop. There were 2 sizable hills, which we saw 3 times. My family drove up, and the 3-loop run made it nice for spectators. I had a decent run for myself. Decent for me, means that I’m not hating myself. I really felt that I maintained a controlled pace/heart rate. I employed the Carolyn Soules – douse yourself with water – method of temperature control, which was key to feeling decent. I didn’t die the last 3 miles (like I did at New Orleans). It was HOT, 90+ with full sun. Fortunately, it was not humid and there was a nice breeze. THANK YOU to the lady with the hose. I fully drenched myself on each loop.